You are here: Home / Recipes / Breakfast / 5 Easy Christmas Breakfast Ideas! 5 Easy Christmas Breakfast Ideas! 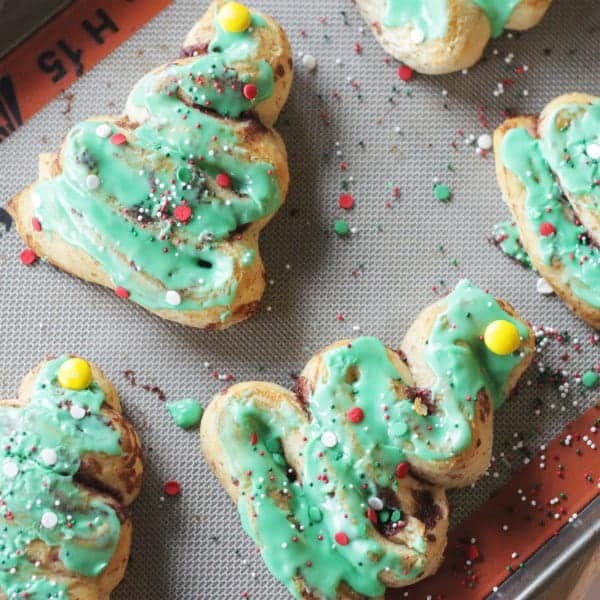 These 5 Christmas Breakfast ideas are equal parts cute, tasty, and of course easy to make! 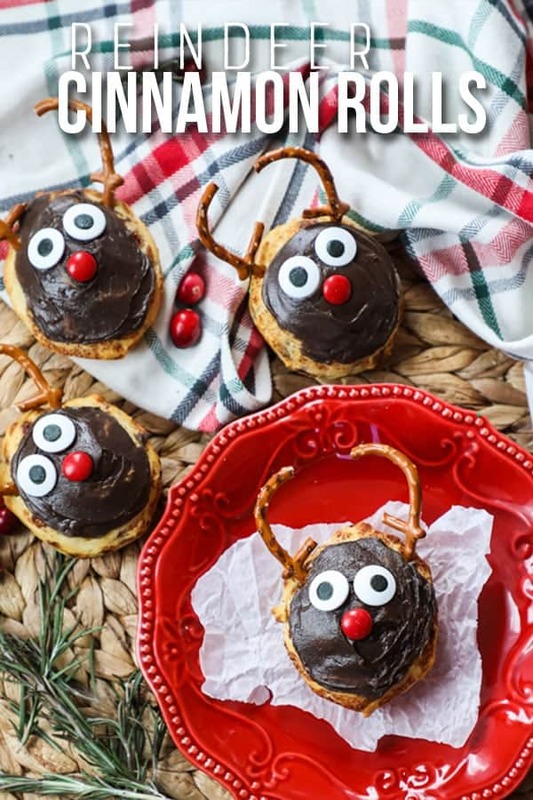 These are perfect for a holiday breakfast that kids will love or make it into a holiday tradition of letting the kids help you. These fun Christmas themed Cinnamon Rolls also make a fun addition to a holiday brunch or pot luck. If your kids are like mine, they start talking about Christmas in about August. So when we do finally get close to the holidays we hit the ground running and try to fit in all the fun and memories that we can. One of our favorite traditions is making fun breakfasts leading up to Christmas! I like to do a few of these different Cinnamon Rolls and let the kids help pick out which ones they want to make. 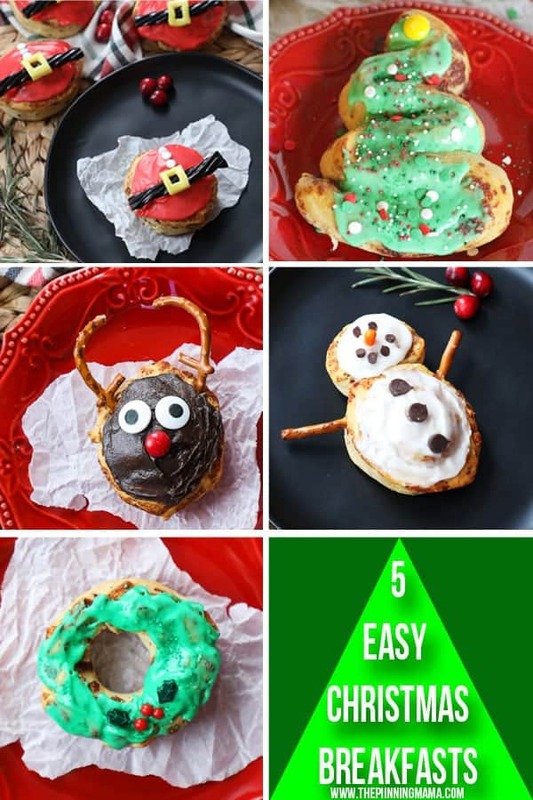 Since all of these are so simple, it makes a perfect project for them to help with and they get a kick out of getting to use the frosting and sprinkles all by themselves. But do keep the vacuum handy ha! Here are the 5 ideas I have for you to have fun the whole holiday season. What is Christmas with out the jolly red guy? These cinnamon rolls are super simple to make and have some serious cute factor to them! Click here for full directions for Cinnamon Roll Santa. These are such a fun way to reconfigure the cinnamon rolls! Just peel them apart and put them back together as trees. My kids favorite part is using our sprinkle stash as ornaments to decorate their tree! Click here for full directions for Cinnamon Roll Christmas Trees. Now if these aren’t just the cutest, then I don’t know what is! I love that these bake just as-is from the package and then with a few little extras they are transformed into Santa’s reindeer. This is probably the quickest breakfast on the list. Click here for full directions for Cinnamon Roll Reindeer. You can’t leave Frosty out of the party! 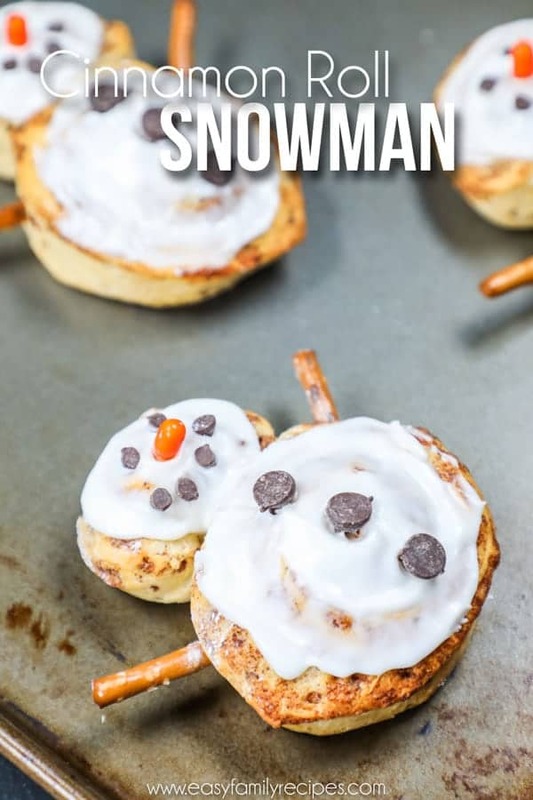 Cinnamon rolls are transformed into an adorable snowman just the help of some pretzel arms and a few chocolate chips. This is another fun one to let the kids get creative with giving their snowman a face. You can even get more into the spirit by adding a scarf, hat, or anything else you and your kids can come up with. Click here for full directions for Cinnamon Roll Snowman. The last holiday breakfast on my list are these simple, but beautiful cinnamon roll wreaths. All you do to make these is use a cookie cutter to cut a circle from the middle of each roll then use scissors to clip around the edges to make it have texture. Bake as directed, reducing the cook time by 1-2 minutes. Dye the icing green using food coloring, then frost the cinnamon rolls and add sprinkles. I got my Holly and Berries sprinkles at Walmart. I hope this leaves you inspired to make some fun memories with the family! If you get a chance to make one (or all!) of these, I would love it if you would leave me a message in the comments or tag me in a pic on your Facebook or Instagram stories @easyfamilyrecipes. It makes me so happy to see others enjoying the ideas from the blog! 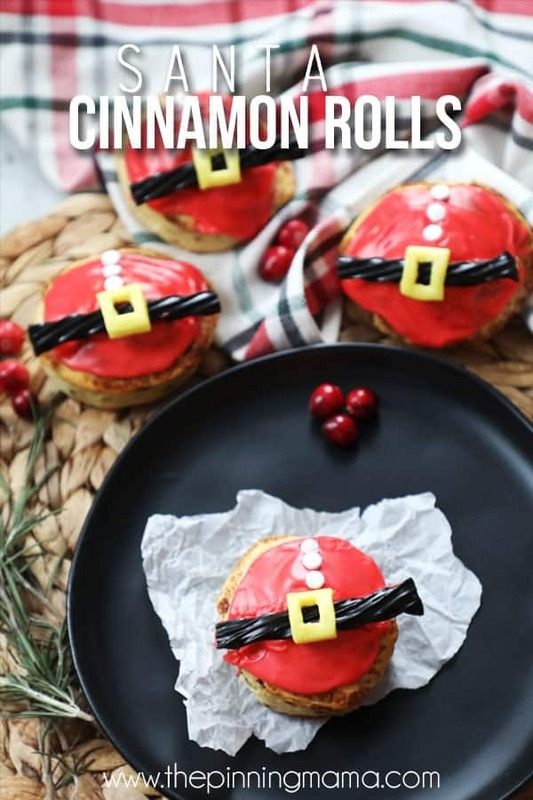 « Cinnamon Roll Santa – Easy Christmas Breakfast Idea! Such cute and easy ideas! 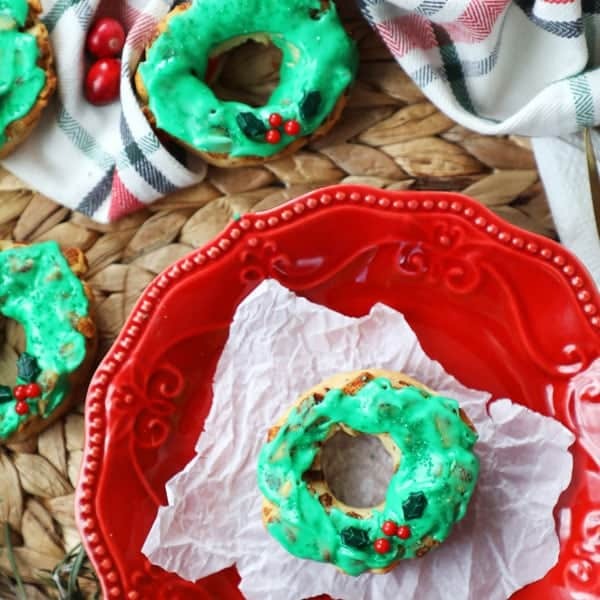 So cute and festive and easy! I’m always looking or breakfast ideas for Christmas morning…we always scramble at the last minute!